(Ver 2.2) Today is now Part 12 of a very important series of lessons on Understanding Seeds in the Bible. We have covered a lot of very significant information that will not be repeated so I would highly recommend that you go back and start your reading with “Part 1”. I almost purposely left this part of this subject of seeds out of the series because it is so popularly preached on TV that it gives many a negative perception on a positive subject. However, money and finances are clearly found in the Bible so I will touch on it today. I believe if you study the Gospels you will see that Jesus taught on money more than any other subject. I have heard many preachers, especially TV preachers, jump all over this subject and it appears to come across that they do it because they are only after your money. Of course I do not judge them because I do not know their hearts, only God knows a man’s motivation for doing what he does. It could be that God told them to teach this subject with great emphasis and I would sound like a fool if I would criticize what God does. So, I cannot say or will not judge if this is true or not, I just said it just appears to many to be this way because of the emphasis that they are placing on a minor part of a much greater subject about seeds. It would seem to me that to only pick one part of a subject and teach that causes the wrong perceptions to be given and to many people it is true that perception becomes reality and this is not a good image to portray to the world. So far, I have given you eleven different lessons about seeds in the Bible and have not mentioned money or finances even once. I guess since I do these Bible lessons for free and never ask you for money, is the one reason that I can include this lesson on money in the series today. In searching the Bible for any form of the word “seed” I found approximately 257 verses in the KJV that directly mentioned this word. Out of this total I counted less than 20 verses that speak about money or that can be applied to money directly. Of course this is a subjective number of verses depending upon your desire to try to apply verses from one topic to another. This is certainly a legal method of Bible interpretation; God does it all the time. You can find that God used the same word seed to describe at least 10 different things in the Bible and the laws and principles that govern them are universal truths that cross over into each topic area. But, it is always difficult to teach some subjects like money and not sound like you are asking for money, especially in light of what the Bible says on this subject. That is just the inherit problem with this subject and I will do the best that I can in spite of this appearance. I hope that you can see the difference in what I say since there are no names or ministry names attached to this website and no donate buttons anywhere that allows you to give money to me. If you are a Christian you should be giving your money to where you go to church and are being fed spiritually; we’ll see more about this as we go into this lesson. So even though seeds of finance are a minor part of this subject in this entire seed topic realm, it is still a valid concept that applies to your money. First, off think about this, farming and agriculture were common methods of income in Bible days. The seed concepts of sowing and reaping applied whether you planted corn or raised sheep. If you farmed then you raised crops or animals that could be sold or traded to others. So the seed concepts found in the Bible about farming must also apply to modern day money and finances directly, also. Farmers used seeds to grow crops and these crops produced more food than the originally planted seeds. So the principles of sowing seeds into good ground, seed increase and multiplication are clearly applicable to our modern money. In the world of finances money would represent the seed. Today we can take money and invest it in the stock market or whatever expecting it to grow over time. This is a seed principle that works when you plant your seeds in good ground. You see good ground in the financial world are the companies that are going to be profitable. If you place your money in a company that is foolish then it can go out of business and you lose your investment and that is the definition of planting your seed into bad ground. In America we have many people who buy lottery tickets. These are people who are hoping to hit it big and win millions of dollars overnight. I have not found that concept in the Bible. In the Bible if you want millions of dollars you must start with what you have and plant it to cause it to grow into millions of dollars. This is the Bible concept of financial seed planting and reaping an increase. These are clear Bible farming concepts that you need to learn and to apply to your life and what you do in the world. If you are expecting to hit it big and get rich over night the odds are that it will not happen. Yes, the lottery does occasionally reward someone with a large payment that gives the appearance of the possibility that it can happen to anyone. However, mathematically speaking the odds of it happening to you is extremely low; in fact it is more likely that you will get hit by lightning and die than to think that you will win the lottery. So let’s examine some scripture that can apply to money and finances in relation to seeds. While this scripture does not directly mention money it can be applied to money very easily. This verse states a Bible law that establishes the concept of planting seeds and reaping harvests as long as the earth exists. This would seem to imply that this principle will exist in the new earth to come also, so it seems to me to be a concept that we need to learn. God tells us that our world was designed to be a seed world of sowing and reaping. If you plant your seeds in good ground you will always harvest an increased crop or return on your initial investment. Your seeds sown are always your initial investment that you risk losing. 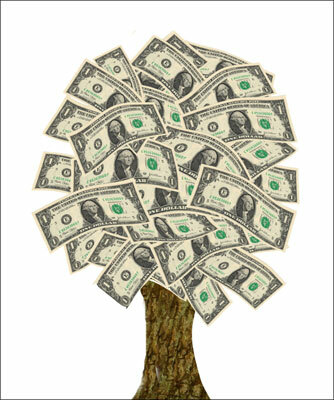 The same enemies that you find in the natural world of natural seeds also apply symbolically to the financial world. The concept of weeds, insects and the birds of the air that eat your seed; these are all symbolic enemies to financial dealings. Before you can invest money anywhere you should first determine if this is good ground to plant in. Too many times people put money somewhere and then change it to something else before they make anything where it is planted. This would be like planting corn seed in the ground today and then digging it up tomorrow to take it to another field that you heard was better ground. If you think this is stupid to do, you are right, but in the financial world people do it everyday. What I wanted to do was to show you that every seed sown can have an enemy. Here we have God telling the children of Israel that the seeds they have sown will be eaten by their enemies. This was usually caused by a reckless disregard for obeying the Word of God. Whenever the children of Israel disobeyed God, this would open the door and allow enemies to come in and take what they had worked for. So this is a lesson for Christian to learn from as a bad example of what not to do. Deu 28:38 Thou shalt carry much seed out into the field, and shalt gather but little in; for the locust shall consume it. So you can see another verse where insects can come and eat your seed. Here God says that you will take a lot of seeds into your field and harvest very little of them because they were all eaten by an enemy. In our world today, financial enemies abound all around us. There are false investment schemes that take your money and you can lose everything. A man in the U.S. is serving jail time right now for taking billions of dollars from people and spending it on himself and his family. His lavish lifestyle lasted for several years until it finally caught up with him, but most of the people that put their money in his false funds all lost their money. These are some of the potential enemies to financial transactions and many of them are backed by satanic influences that causes you lose your money. Deu 14:22 Thou shalt truly tithe all the increase of thy seed, that the field bringeth forth year by year. 2Co 9:6 But this I say, He which soweth sparingly shall reap also sparingly; and he which soweth bountifully shall reap also bountifully. As you can see from this verse, God is comparing several similar concepts of financial matters. God says nobody finances their own war. God says nobody plants a crop and not also eats from it. Nobody raises sheep and not drink the milk of the flock. These are all symbolic representations of a spiritual set of realities found in the Bible. We the church are in a spiritual warfare with a spiritual enemy named Satan. Then Paul was a sower of the word of God and he says that anyone who sows will eat from that which he has sown. Then sheep are a widely symbolic representation of the people of God in the Bible. So the clear implied meaning is Paul fed the sheep and the sheep fed him back. This is not rocket science so grasp these simple concepts and learn to live by them. 1Co 9:9 For it is written in the law of Moses, Thou shalt not muzzle the mouth of the ox that treadeth out the corn. Doth God take care for oxen? Here we have a Bible concept that is very profound being explained. Many times God writes a Bible verse about natural things that cross over into the spiritual realm and this is a prime example of this. Paul is saying that God wrote about oxen and corn but that these apply to him and to us. In other words God did not write this verse for the benefit of the oxen, it was written for our benefit so that we can learn from it. Oxen when treading corn are said to be partakers of the corn and this is a Bible principle given to us from God. If the oxen are working then they should eat from their labors of work. 1Co 9:11 If we have sown unto you spiritual things, is it a great thing if we shall reap your carnal things? So this is a popular TV preacher verse found in the Bible. However, Paul is not writing this asking for their money he is only explaining a very powerful concept of sowing and reaping. Paul was sowing spiritual seeds into their lives and Paul said it was good for them to give back carnal or natural things back to him. In this verse Paul is claiming to be like the oxen that was working and that he should be a partaker of his own labor. However, what we see here are two principles being exercised simultaneously. To give to Paul would cause Paul to receive a harvest from what he has previously spiritually sown from the Word of God. For them to give financially to Paul is a concept of them planting back natural seeds into good ground; therefore they can also expect a harvest for what they have planted. In other words if they wanted Paul to continue to bless them with spiritual things it was good for them to give to Paul of their natural things like money, food, etc. so that Paul could live on the earth to continue to preach and not have to work to eat. 1Co 9:13 Do ye not know that they which minister about holy things live of the things of the temple? and they which wait at the altar are partakers with the altar? As we continue to read in this chapter, Paul and God is giving us a key principle that ministers of the gospel are partakers of those which they minister to. In other words this was a designed system of church government by God. It promotes a minister who is focused on you and not himself. If your minister had to work for a living in the world, you and the rest of the church would be a secondary thought to his primary time taker of working for a living. However, if the church pays for his wellbeing and financial needs then the minister can focus on God and the church and ministering to the sheep of God and not have to worry about where he will eat tomorrow. Jesus tells us that God did not charge us for the information that we learned to preach, so we should not charge others to hear it also. That is why I do a free blog on a free website and I never ask for money or request you to send me a donation. Money is not a motivational factor and why I do what I do. However, that does not mean you should not do what God says to do either. Wow, this is a very complex subject that involves the participation of everyone doing what they should do, when they should do it and then everything works according to God’s designed plan. So that is why I did not want to include this lesson in my series about seeds, because it can very easily be taken wrong. I probably ended this lesson and sounded like you should give me something for the spiritual seeds that I have given to you; and that is not what I said at all. I said that I do these lessons for free because I love being a blessing to others. So I try to do the right things according to the word of God and you should do the same. If you noticed this blog is called the “Agapegeek” Blog and not my name. That means I am anonymous and you do not know me or my address to send me anything. I do this on purpose also. How you can bless me is to tell a friend about what you have learned and increase the traffic on my web site. That would be one of the greatest ways that you can be a blessing to me. If you learned anything about giving and sowing financially then you should give to your local pastor to help support your church to grow. We have just briefly covered a much broader subject of sowing and reaping financially from the Word of God. This is a complex subject and one that is not easily understood by many. Many people find it very difficult to relate their money to be like a seed that can be planted into ground to grow and increase. However, you can certainly find this concept in the Bible therefore you can personally choose to participate in it or to ignore it. Thanks for reading my Bible Study and God Bless! Posted on November 3, 2010, in Bible Study, Seeds, Understanding and tagged Bible, Christianity, Church, God, Holy Spirit, Interpretation, Jesus, Money, Prophecy, Religion, Revelation, seeds, Truth, understanding. Bookmark the permalink. 41 Comments. Love the info, thanks pastor for trying to reveal the mind of God to us , I greatly appreciate it..blessings to u and family. Thank you for your kind blessing. God is so Good. Jesus be praised. Thank you so much for this series. Awesome Holy Spirit led work. Pray that I can get more people to read your blogs. Please write more on sowing and reaping financially. This is a very contentious topic which you as an independent blogger can tackle more effectively than our Pastors. You have adequately watered the seed sown by my Past tor. Agapegeek, stay blessed for blessing me and many others. Thank you for you time being led by the Spirit of God and for the kind comment. God Bless you. Thank you for your time and wisdom you’ve made known to us. I have truly been blessed and enlightened by your teachings in this 12 episode series. I pray that the Spirit of God who lead me to your blog will lead me to minister His Word as you’ve done. God richly bless you. I have a question that has been bordering me for some time that I hope you can help me. I have been paying tithe for years as I was taught by my church leaders according to Malachi 3 until last year when I read an article that says tithe which is a compulsory /obligatory payment is not for Christians (ecklesia). Rather freely given for God’s work is recommended since God loves a cheerful giver. Since then, I have been reading, researching and praying about it but I am still not clear since I been getting a conflicting ideas on the subject. This has affected the mode of my tithe payment. I want to know the will of God and obey it in this respect. Please help. Sorry for the delay in answering your question. Tithing occurs before the law and after the law. I believe based upon my understanding of the Bible that tithing transcends the Old Covenant and the Law. Cain and Abel appear to be tithing in the beginning of Genesis. Jesus is referred to as our New Covenant High Priest who receives our tithes in Hebrews. Pray and ask the LORD to show you what you should do. Trust His direction and be obedient. God Bless. This was a very well thought out and helpful study. It has truly taken me deeper into the understanding of biblical seeds. God bless you! Thank you for your time reading and commenting. God Bless you. God bless you and sustain you. you are gift of God to the world. I have been enlightened. Thank you so much for all the hard work on this series. I have learned so much and I am so grateful, really amazing! Wow..bless you..l believed our hearts were the soil..gardens of our God within..and to hear and see more clearly the understanding of Gods seed..wow..my holyspirit lead me to your site..and such watering l have had..Amen…oh l answered to Jesus knocking at my door almost 3years ago..and l hungrly eat our Lords word that is food for my life. I have read all your lessons on seeds and they were all revealing. I have a better understanding of certain spiritual truths in the bible better than when I started. I do not know how I came about your page but thank God for the Holy Spirit. May God continually bless and increase you for your labour of love. Please forgive me, but I do not have the time or space to reply to this question adequately. Financial seed sowing is a valid Bible principle. However, doing it because another person does it is not wisdom. Sowing should only be done after someone studies the subject personally to obtain a firm foundation of faith and confidence in God’s promises on the subject. Then pray and ask God what you should sow. Follow the Spirit of God’s direction and instruction and I believe you will not fail to be blessed for your obedience to God. God Bless. Thank you very much for your very kind comments. God Bless you very much. Thank you,I read all chapters up to 12,and I find them spiritual eye-opener .God bless you. I am truly blessed! would like further discussions pls, and would like to email. Awesome article! I have been trying to practice Ecclesiastes 11:2, but not sure if I am chasing after the wind or actually planting seeds. So I needed better clarification what the seeds actually are. Thanks! Absolutely mind blowing! The entire Scriptures from Genesis to Revelation talks about seed and having a clearer understanding helps one to navigate through every other aspect of the Christian life. Thank you for the time you spent in searching the Scriptures and making it available to others. Permit me to highlight too that an understanding of this principles and other principles in the Bible helps us to appreciate better the central theme about the Bible which is the Kingdom Of God hence when we seek it first and its righteousness every other thing shall be added. As you referred to in the course of the teaching in Matthew 13, it is instructional to note that the enemy or the evil one comes to steal the Word of the Kingdom of God when we lack understanding of same. once again, many thanks and shalom. Thank you very much this is very insightful and based on the word of God! I love your break downs of the Word! God has truly blessed you to teach the gospel. Be it well with you and yours and May God supply your every spiritual need and natural need. Thank you for you kind words of blessings. I appreciate them very much. God Bless you. You use your gift so beautifully! I appreciate you for this article and you word it so plain and clear. May God always bless you! Thank you for you time and your comments. Be blessed! Thank u for the teaching it is easy to understand made easy in language very importantly not complexed for digestion. As many Pastors finds it easy to ask for money for there programs so also many finds it hard to even teach the topic in their Churches. Thank u for taking the subject with keen interest and treated it so diligently. God Bless you my friend in Christ and thank you for your comments of blessings. I appreciate you taking the time to read and to study and for sharing your thoughts. Have a great New Year. What’s so amazing God revel the seed to me as I was reading Luke 8. I couldn’t figure out why I couldn’t get off or move on to Luke chapter 9 . I spend over a week on chapter 8 . I understand every thing u were talking about in your first 6 or 7 lessons on seed. My family couldn’t understand what I was talking about. I found your blog yesterday and I glade to see Iam not that only one. In fact its not me but God him me. Thank you for being so kind to leave a positive comment and for taking the time to study God’s Word. You are a blessing. Thanks for this article. I’ve gained a new appreciation for the “seed” concept in the bible! Thanks for taking the time to study the Bible! God Bless You!